(APN) ATLANTA — Several people experiencing homelessness have frozen to death on the streets of Metro Atlanta so far through the winter season of late 2017 and early 2018, as unusually cold weather and snow storms have made it even more treacherous to be homeless and unsheltered in Atlanta. Atlanta Progressive News received statistics of hypothermia deaths from December 06, 2017 through January 15, 2018, from the Fulton County Office of Medical Examiners (morgue). A total of eleven people died of hypothermia during that time frame, including seven Black males, two Black females, one White female, and one White male, ages ranging between 45 and 87. Fulton County determined that eight, or 73 percent of those who died from hypothermia, were homeless people. Word on the street puts the number higher. Meanwhile, the figure of eleven deaths is for only Fulton County, and does not include DeKalb County. The winter is not over; and without shelter, more may die. City of Atlanta spokesperson Jenna Garland told APN the City does not have a mechanism for tracking how many homeless deaths occur in the City of Atlanta. The City opened three “low barrier” warming shelters in response to the cold weather emergencies, including one at the old Adamsville Recreation Center at 340 Delmar Lane, N.W. ; one at the Grant Park Recreation Center at 537 Park Avenue, S.E. ; and one at the Central Park Recreation Center at 400 Merrits Avenue, N.E. Two of the warming shelters were at full capacity, according to a Jan. 05, 2018 email from the City, and the Grant Park location was added as a third location. 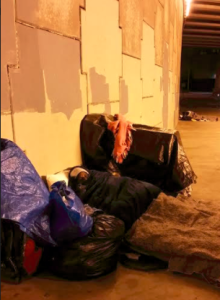 Advocates have been driving around Atlanta in the late hours of the night, looking for people who were homeless and outside, offering to take them to the warming centers – many people have refused to go. Homeless deaths are nothing new in Atlanta. Advocacy groups have held a Homeless Memorial Day every December 01 since 1988, when, according to the Metro Atlanta Task Force for the Homeless, seventeen homeless people died. It is not immediately clear whether the day was observed in 2017, as the Task Force has been regrouping. Just before the onset of the current winter season, the shelter formerly run by the Metro Atlanta Task Force for the Homeless, at Peachtree and Pine Streets, closed after years of litigation and a settlement that provided for the shelter to close. While the City of Atlanta is looking to open two or possibly three new shelters as the result of the Homeless Opportunity Bond created last year in 2017, this is an effort still in its early stages; and the loss of Peachtree-Pine has had the immediate effect of removing hundreds of permanent shelter beds from the system. UPDATE: The newly-reopened Jefferson Place facility–now known as the Evolution Center–has finally re-opened during one of the recent cold spells. Jefferson Place, which had primarily received funding through Fulton County, had closed in 2014. UPDATE: The City also opened a new shelter for woman and families late last year, utilizing funds from the Homeless Opportunity Bond, according to Garland. The location of this particular facility is not to be publicly disclosed for safety and confidentiality reasons. As previously reported by APN, the City, Central Atlanta Progress, and others waged a vicious years-long campaign to sabotage the Task Force. And yet, the Task Force served a critical function, by sheltering many homeless people who were routinely turned away by other service providers. Central Atlanta Progress and the City’s Continuum of Care made efforts to place all of the Task Force’s residents in other shelters or housing, including by partnering with the Atlanta Housing Authority to provide vouchers for some. Yet, some homeless people who received vouchers had a difficult time finding a property owner willing to accept the voucher. Despite these efforts, there are still hundreds, if not thousands, of homeless people throughout Metro Atlanta, who are sleeping in the streets, under bridges, in doorways, in the woods, in cars – in below freezing weather, and some are dying. Even if CAP and the CoC placed every Task Force resident in shelter or housing–which appears unlikely–that does not include people who became homeless after the date CAP took over Peachtree-Pine, nor does it include people who were homeless and not at the Task Force. Marshall Rancifer, Founder of the Justice for All Coalition, and a formerly homeless person, has been out almost every night giving out hand warmers and blankets to unsheltered people, and taking those willing to go to warming shelters. This reporter went out one night with Rancifer; and on another night with Haroun Shahid Wakil and the Street Groomers, who are also helping people sleeping outside with blankets and food. At only two locations, this reporter observed over thirty people sleeping outside in freezing weather. There are at least dozens of other locations with more people sleeping outside throughout Fulton and DeKalb Counties. Sylvia, an elderly woman sleeping under a bridge behind Grady Hospital, said she would go to a shelter if they would allow her to bring in her belongings. But they won’t, she says, so she risks death to guard the meager belongings she has. She has a sweet attitude in spite of her circumstances. “I have to pack up everything I own every morning and take them with me,” Sylvia said, sitting next to her shopping cart draped with a tarp to keep the wind partially off of her. Late at night with the temperature dropping below 20 degrees, a man huddled in front of Central Presbyterian Church. He told APN that he was banned from the shelter after he defended himself from an attack by another homeless man. “I get Social Security and stay in a motel until my money runs out and then I’m back in the street,” he said. He is willing to stay in a shelter especially when it is below freezing, but wants an independent living place. He has an application in for an apartment and is on a waiting list, he said. He was told it may take one or two years before they have an apartment for him. “I don’t like shelters, they have too many rules, too many people packed in, and I like my freedom,” another man said. “This is supposed to be the City that helps people, the home of Civil Rights, and should be the model city of doing the right thing for people on the bottom. If they really want to help the homeless, they could take some of that homeless money and redo these boarded-up apartments and buildings and put people in them,” he said. They both complained about shelters that they say turn folks out at 6 a.m., when it is still cold and wet. Where do they go at that hour? One size does not fit all when it comes to currently unsheltered citizens. Most only want a small room where they can feel safe and bring their belongings and/or pets: a place where they can come and go when they need to, not where someone tells them to leave every morning. UPDATE 1 and CORRECTIONS: A previous version of this article stated that while the City anticipated two or three new shelters to open as a result of the Homeless Opportunity Bond, that none had re-opened yet. This article has been corrected to reflect that, in fact, the Jefferson Place shelter has re-opened, and a new shelter for women and families has also opened. This story has gone all over the nation. This is not good for Atlanta that shows its priorities is to spend money on expensive renewable energy solar energy and let the poor die. I believe that the major reason the Peachtree Pine shelter was closed is because powerful, callous, business interests wanted that valuable building. If there is a hell in this universe, and if Kaseem Reed and others, don’t wind up there, I know few others will ever go to that fiery furnace below! A shelter like that should not be in the middle of town. I am glad its closed. Why not? It seems to me the middle of town is closer to social services and transportation, so that people can come out of homelessness. There are 3 things we can do: Open warming stations, even rural areas have done this in Fire Stations. WE can pass out better coats and long underwear this can make a difference. We can reopen closed shelters and renovate abandoned property. # Things to do: Open warming stations. 2 Pass out better winter coats and long underwear.3 Renovate abandoned property for use by non profit groups that treat and prevent homelessness.